Making a difference in distressed communities, CohnReznick has been on the cutting edge of innovative community development for more than 30 years. Whether it is working within tax credit programs , helping shape policy at Federal and state levels, or collaborating with state and local economic development programs, we have helped lead the growth and sophistication of the community development industry. Since the implementation of tax credits and now through the unique approach of Opportunity Zones, CohnReznick has served investors, developers, governmental entities and other stakeholders to help communities reach their full potential. The need for safe, affordable, low-income rental housing has never been greater. Incentives such as the Low-income Housing Tax Credit provide equity to owners and investors that enable them to complete these important projects. Addressing financial goals and insuring that strict agency-driven compliance requirements are met throughout planning, structuring, construction, operation, and exit requires expertise few stakeholders have. As an undisputed leader in affordable housing, CohnReznick’s experience and demonstrated record of problem solving are evident. CohnReznick has one of the most extensive and experienced affordable housing industry practices in the United States. With intimate knowledge of the low-income housing tax credit program and all housing related incentives, we implement results-driven plans from concept through the life of your deal. As an active participant in this industry since its inception, we are often called upon to advise Congress, the Administration, and a variety of government housing authorities on the evolution of affordable housing statutes and programs. Our far-reaching industry network and our ability to foster productive connections are instrumental in creating opportunities. We have helped clients secure millions of dollars in tax credit allocations, meet sensitive deadlines with meticulously prepared documentations and, ultimately, make thousands of homes available for families and communities across the nation and its territories. We offer extensive industry commentary as well as regular communications to keep industry participants up to date on changing regulations and news. 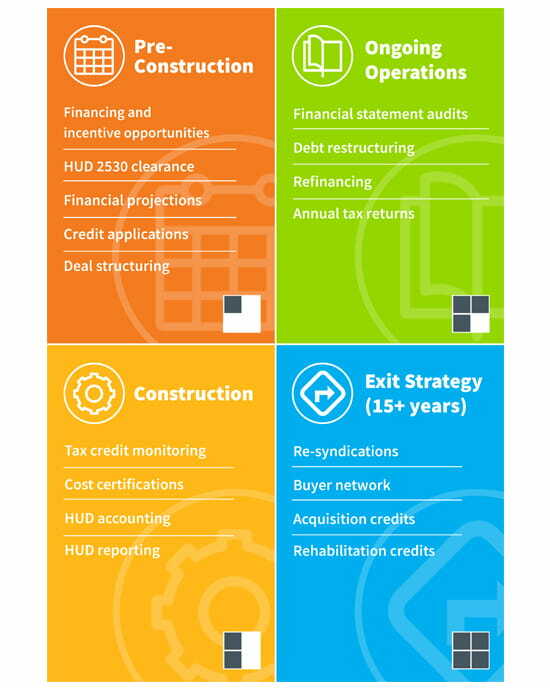 From the earliest days of the tax credit program through current climates, our position in the center of affordable housing conversation brings together thought leaders, developers, investors, syndicators, and government agencies to envision the future of the industry. We provide guidance to owners with pre-construction financial projections to help maximize the project's return. We then identify optimal funding possibilities from conventional financing to tax credit allocations to attracting equity investors. We have unique experience with the complexities of HUD and state agency mandated cost certifications. Tenant file certifications for HUD and the LIHTC are also vital. Maintaining tax credit eligibility throughout the compliance period is critically important. Our team provides the required financial accounting for your deal to avoid issues that could derail your project. Our independent and objective evaluation of cash flow, tax rules, risk, and other performance factors provide essential strategic intelligence to decision makers.